What do teachers do 400 times a day, 70,000 times a year and spend a third of our time in the classroom doing? Allegedly asking questions. Since spending time observing colleagues’ lessons I have started to become very interested in questioning. It is something every teacher does and yet even within our one College the variety of techniques is intriguing. It became clear to me that questioning can be a powerful tool in the classroom for a number of reasons. Obviously it can help check knowledge and therefore be developed into effective AfL, it can help diagnose difficulties that individuals are having to enable effective differentiation, but it can also be used to really make learners think, something that surely benefits every classroom. It is this aspect that I wanted to develop in my teaching and wonder if it might help others to consider. After reading several articles (including from Teacher’s Toolkit online – an amazing resource, Launch Pad, about Bloom’s taxonomy and others, The Educational Leadership publication and various tweets and blogs) I decided to consider more carefully the questioning techniques in our psychology classroom. I started by developing a ‘No Hands’ policy in class, where I would pose questions to the entire class and then pick a particular pupil. This obviously means all pupils are aware that they might be picked and hence must engage in thinking. This did however take the pupils and myself several lessons/weeks but in my opinion has helped engagement and behaviour. Secondly I began to leave more time for pupils to respond. It is thought that on average pupils are provided with close to a second to answer a question, whereas for anything requiring genuine thought, several seconds would be more appropriate. Again this seemed to have a positive impact on the learning however, again, it required practice for myself and the pupils to get used to these ‘uncomfortable silences’. I found by telling my pupils about what ‘we’ were trying to do, and ensuring those who were clearly suffering in silence were not left too long (they were told they could ‘phone a friend’ if struggling), that they were happy to be part of this new approach. We even started to joke about the, now, comfortable silences. From further reading I realised that I was developing a ‘Pose, Pause, Pounce, Bounce’ style of questioning and it felt reassuring to know that many teachers before me had followed this method. This approach has been well documented but I enjoyed reading about it from the ‘Teacher’s Toolkit’ blog which set it out clearly and simply. The ‘bouncing’ element also ensured that pupils listened to their classmates responses as they knew they may be asked to add more or evaluate the previous statement. This also allowed for the second question to access a higher level, by asking pupils to evaluate, improve on, comment on previous pupils’ responses allowing for further development of a sequence of questions. Our next step as a department was to ensure that questioning was being developed across our classrooms. We developed a taxonomy of questions that we felt led to higher order thinking. We considered Blooms and others, but linked the question words specifically to our subject with reference to the key question words used by our exam board. We put a poster of this up in our classrooms to encourage staff use. As we became more proficient with asking different types of questions that were able to encourage more thinking and learning, we also tried to put together sequences of questions to allow discussions to develop in class. We also realised that the focus on questioning had the ability to make our teaching more didactic and hence again we involved the pupils encouraging them to consider their questioning. They also referred to our question poster and soon were developing their own questions and hence understanding. We even started to consider our seating plans to encourage more pupil questioning and discussion. This movement away from ‘teacher talk’ has the potential to really develop discussion and debate in the classroom. Various resources, including the interesting Mr Histoire blog (who queries an over reliance on teacher questions in classrooms), can help provide us with ideas to get the pupils asking and answering questions with less teacher input. 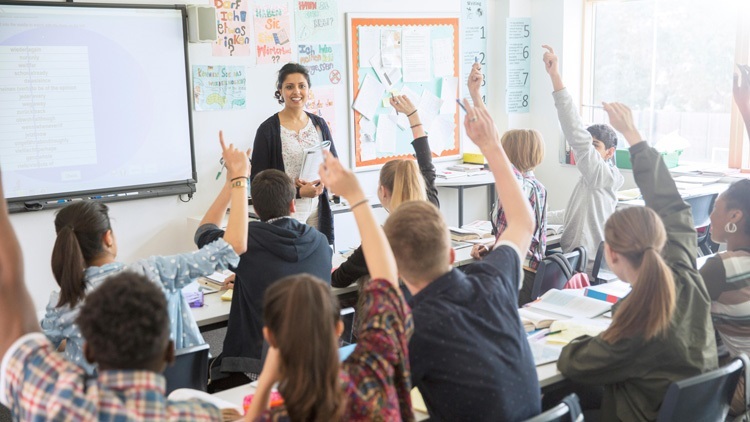 By getting your pupils involved too will ensure they are providing and developing their own questions so this isn’t just about you performing, but trying to improve the pupil learning too. This will also help better integrate questioning into the classroom culture too. Develop your own subject specific question taxonomy, and share it. Finally, as with all discussions on the most effective ways to develop teaching and learning, the above suggestions have come from my own personal experience and hence are clearly subjective in nature. However it is essential that no matter who we are we question our own practise, seek to develop it and share our experiences. Questioning, what do you think? Mike Lamb teaches biology and psychology at Hurstpierpoint College, Sussex.